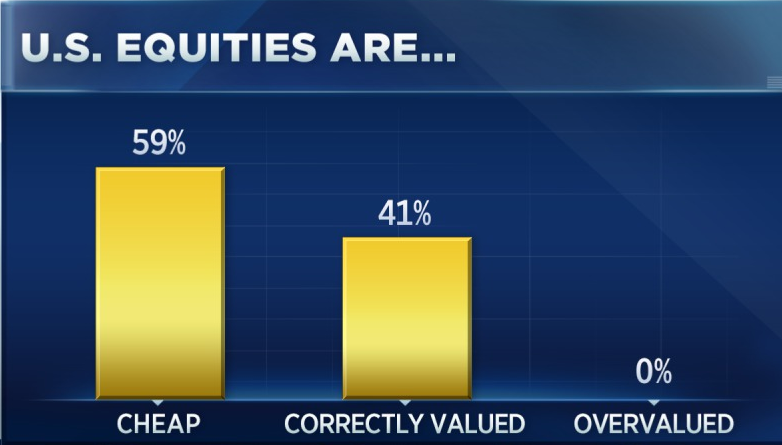 A majority of Wall Street pros see equities rising in 2019, according to CNBC's exclusive "Halftime Report Stock Survey." Respondents believe that stocks look cheap at current valuations and investors should take advantage of the recent pullback and buy the dip. Tech, health care and energy are top sector picks. There were 29 respondents to the survey, including strategists, investors and traders that appear on "Fast Money Halftime Report." Stocks may be coming off their worst year since the financial crisis, but a majority of Wall Street professionals see gains ahead for 2019. 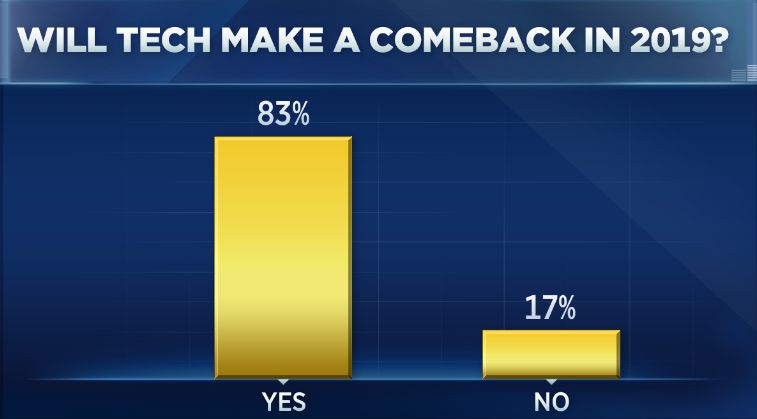 More than 65 percent of respondents to CNBC's exclusive "Halftime Report Stock Survey" said their overall stock market outlook is positive, with more than 58 percent saying equities look cheap at current valuations. And according to the survey, it's time to buy the dip. 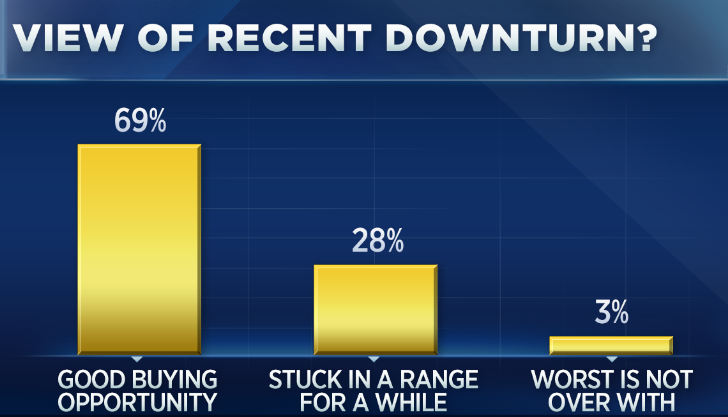 Nearly 70 percent said the recent downturn presents an attractive buying opportunity. Q4 was the worst quarter for the S&P 500 and the Dow in seven years, with each declining more than 11 percent as trade tensions and fears of a global slowdown rocked markets. 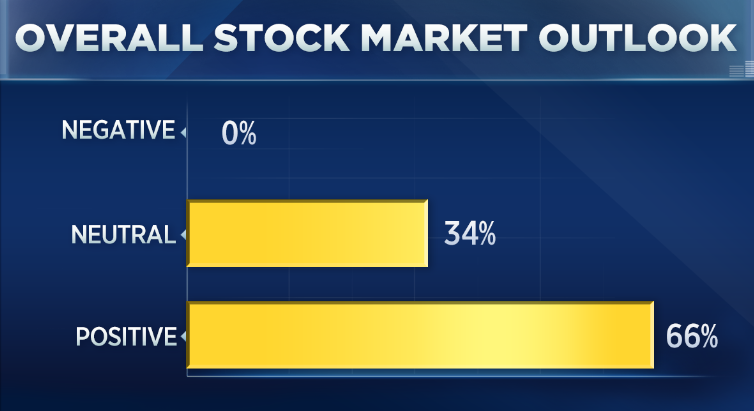 There were 29 respondents in the survey — strategists, investors and traders who appear on "Fast Money Halftime Report." Following this slide, not a single pro responded that he or she believes equities are overvalued at current levels. Just more than 41 percent believe stocks are correctly valued with nearly 60 percent saying valuations look cheap, which indicates an overall bullish sentiment. That said, while less than 4 percent of respondents believe the worst isn't over yet and investors should stay on the sidelines, not all strategists are necessarily predicting outsized gains for the foreseeable future. A little under 30 percent of respondents said they believe stocks will be range-bound for the time being. The tech trade, and the "FAANG" names in particular, led the market higher in 2017, and at the beginning of 2018 it seemed the sector would once again be a winning trade. But calls for widespread regulation as well as privacy scandals hit some of the biggest names hard. The sector ultimately finished the year in the red, breaking a nine-year winning streak with its worst year in a decade. The Street, however, believes it could once again be a hot spot for investors in 2019. Around 83 percent of strategists believe the sector will bounce back in the coming year, and roughly 64 percent count it among their top three sector picks going forward. Health care and energy were two other popular choices, with roughly 43 percent and 46 percent, respectively, of strategists calling them top picks. Health care was the top-performing S&P sector in 2018 gaining almost 5 percent, while energy was the worst sector, falling 20.5 percent. Volatility was an overarching theme in the market for 2018 with triple-digit swings becoming the norm, especially toward the end of the year. Fears of a trade war, slowing global growth and rising rates all hit stocks during 2018. Strategists may be overall bullish on the market, but they did still identify potential risks to the upside thesis. A global slowdown and the possibility of a trade war are the top areas of concern, according to respondents, with around 38 percent of strategists voting for each. Roughly one-fifth believe the Federal Reserve hiking too aggressively is the biggest potential headwind for stocks in 2019. Some Wall Street bears have cited a potential slowdown in corporate earnings as a reason to get out of the market, especially after Apple cut its fiscal first-quarter guidance. 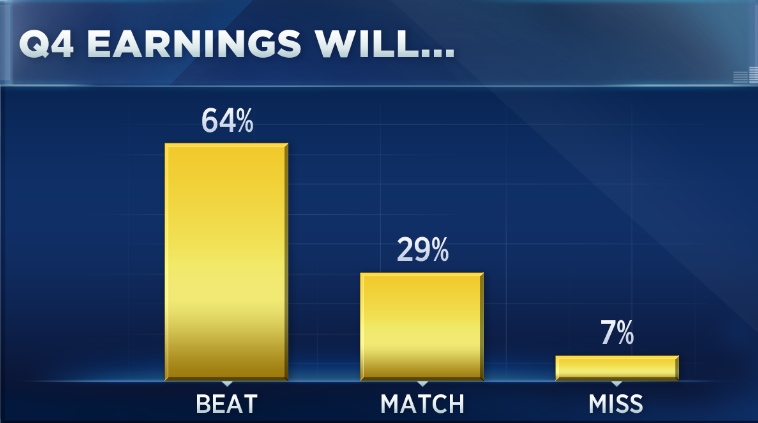 But for now, at least, a majority of strategists remain optimistic about fourth-quarter earnings. Just more than 64 percent believe reports will top estimates, with less than 8 percent predicting a miss. Roughly 29 percent are predicting quarterly results to be in line with analyst expectations. Stocks surged Friday in part thanks to comments from Federal Reserve Chairman Jerome Powell that the central bank will be patient in raising rates, quelling fears of tighter monetary policy in the near future. 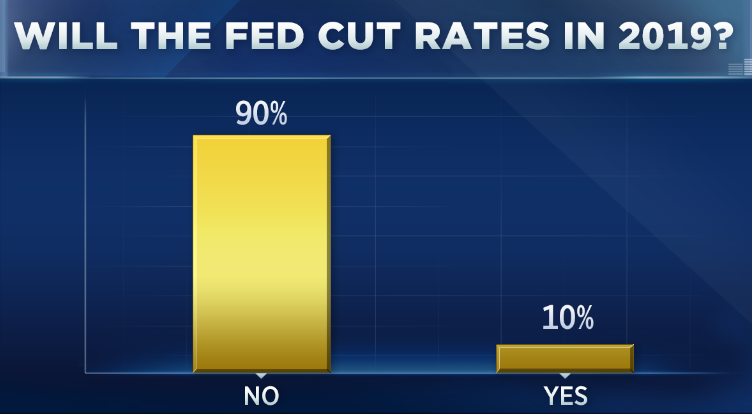 In response to recent talk that the Fed may cut rates in 2019, only around 10 percent of the respondents believe that is possible. —CNBC's Fred Imbert contributed to this report.